James Luna’s project for One Day Sculpture will be next Thursday 26 March 8 am – 4pm at the Te Papa Amphitheatre (Soundings Theatre if the weather is bad). The project is called Urban (Almost) Rituals and it promises to be a multifaceted piece that will unfold in four acts over the 8 hours. As one might expect if familiar with James’s work there will be a mixture of talk, music, action and installation of objects. I don’t want to give any details away so that there will be a sense of surprise on the day. If you can’t make it to Te Papa to see the project then you can watch the work online via this link www.tepapa.govt.nz/jamesluna . At the moment this link takes you to the Te Papa info page on James, but on the day, during the performance it will be a live stream.After Urban (Almost) Rituals the One Day Sculpture Symposium is launched with the Keynote lecture by Professor Jane Rendell from 6-8pm. The Friday and Saturday programmes include a mixture of formats including Project Case Studies – artist and curator discussions of One Day Sculpture projects. This includes a discussion between James Luna, Megan Tamati-Quennell and Caroline Vercoe on Saturday. For more information see the Symposium page on the One Day Sculpture site. For those who want to find out more about James Luna and his work before Urban (Almost) Rituals, he will be presenting a lecture here at Te Papa on Wednesday 25th March 3-4pm in Soundings Theatre. This is a free event and all are welcome. As far as I know James doesn’t have plans to return to NZ anytime soon. He has been to Europe. 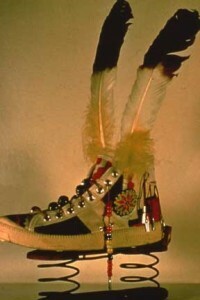 In 2005 he was the representative of the National Museum of the American Indian (NMAI), part of the Smithsonian, at the Venice Biennale. You can find info about that, plus a whole lot of other things he has done, on his website http://www.jamesluna.com. I’m sure James would be interested in an invitation to the Edinburgh Festival. Contact details for him and his agent Nola are also on his website. Do you have any news on when James will next be visiting? I have watched his performances on you tube and like the way that he mixes sense of humour with the sense of tradition he so readily evokes. I enjoy his understandings of the human condition. And the way he criticises the stereo-types we all adhere without thinking things through. Has he ever travelled to Europe? I am originally from Edinburgh, in Scotland UK, and I know that there would be a lot of interest if he chose to give a performance, especially around the time of the festival (August).